The iPhone 8 will ditch the home button in favor of gesture controls, according to a new report. The oft-accurate Mark Gurman of Bloomberg saw images of the upcoming high-end iPhone and spoke with the standard "people familiar with the gadget." Gurman says the so-called iPhone 8 will feature some of the biggest changes we've seen in the iPhone since its debut 10 years ago, including a nearly all-screen front. Apple apparently has several iPhone designs in testing, including one that eliminates a home button – either physical or digital – entirely. Instead of pressing the home button to perform functions such as calling up Siri and viewing app screens, users will maneuver around the iPhone 8 using gestures. At least one design features a slender software bar along the bottom of the iPhone 8 screen. Users drag the bar upward to unlock the iPhone, and more flicks and swipes close apps or open the multitasking function. Of course, the iPhone that makes it to consumer hands could be quite different from the concepts Apple is testing, so don't take today's report as confirmation the iPhone 8 is doing away with the home button. However, it's sounding increasingly like Apple is leaning that way as the tech giant looks to make a splash with the 10th anniversary iPhone. In addition to eliminating any semblance of a home button, Gurman also notes the iPhone 8's OLED screen will be taller and larger than the iPhone 7 Plus, though the phone itself will be sized close to the iPhone 7. The iPhone 8 display will also feature rounded corners. However, the screen won't be prominently curved like Samsung phones, such as the Galaxy S8 and Galaxy S8 Plus. A metal band (a la the iPhone 4 and iPhone 4S) with antennas reportedly runs around the edge of the iPhone 8, and the phone's bezels will be uniform around the entire screen. This means the thick black strips where the earpiece and home button on current-gen iPhones live will no longer be there. Unique to the iPhone 8 is that it will have a shelf along the top where the front camera, sensors, earpiece, and antenna will be housed, according to today's report. The display notch has been reported previously. Previous rumors have said the iPhone 8 will feature facial recognition tech for advanced security, and today's report says the Face ID sensors will be housed in the display's top shelf. Other details outlined in Bloomberg's report include a dock along the iPhone 8's bottom that takes cues from the iPad, an elongated power button located on the side of the phone, and, despite greater screen real estate, an app layout consistent with today's iPhones (six rows with 24 icons on a page). 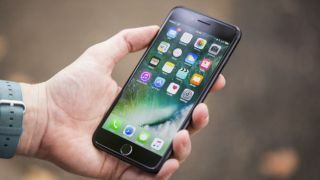 Apple is expected to launch the iPhone 7S, iPhone 7S Plus, Apple Watch 3 and a 4K Apple TV alongside the iPhone 8, plus reveal the public release date of iOS 11. Apple's new devices will make their debut during an upcoming Apple event, reportedly taking place on September 12.